My name is Gary Black, and I am a very fortunate survivor of severe sepsis. This website has been designed to increase awareness about sepsis. 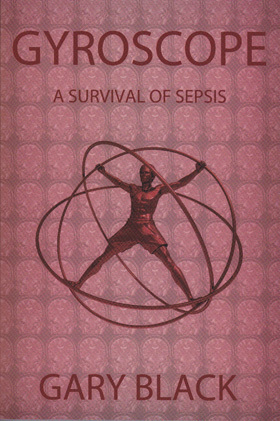 It showcases my recently published book: GYROSCOPE, A Survival of Sepsis, and discusses current investigations and research about sepsis. GYROSCOPE reveals my entire harrowing experience of cascading to the edge of death from severe sepsis. 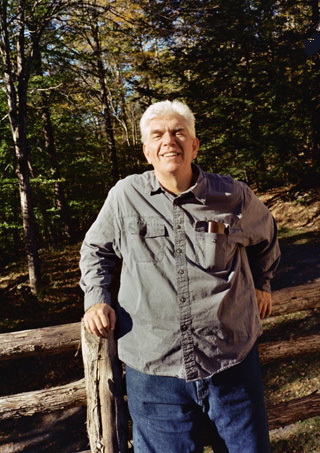 It explores my mental, physical, and spiritual traumas and triumphs from onset to recovery. 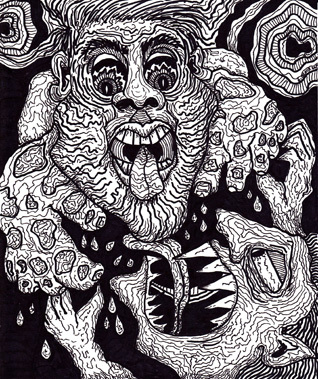 It also includes 52 illustrations that express my pain, anguish, dreams, delirium, and personal awakenings, a brief medical glossary, and research references. I hope that this true story, written from a patient's perspective, will provide sepsis awareness to the public and health care professionals. I also hope that it will make a difference in your life. I was born and raised in the Cleveland, Ohio area. I earned my M.Ed., B.S.Ed., and B.F.A. at Kent State University, and my A.A. at Cuyahoga Community College. I am an artist, musician, songwriter, art educator, and guitar instructor. I have produced, recorded, and performed my original music, and I am an accomplished artist in painting, drawing, sculpture and assemblage. My life changed dramatically on July 20th, 2009, when severe sepsis overcame me and brought me to the edge of death. Inspired by a miraculous recovery, I wrote my first book, GYROSCOPE. I now live in Raleigh, North Carolina. My book is available worldwide at Amazon.com, Barnes&Noble, Infinity Publishing (www.bbotw.com), etc. This picture was taken July, 2009 in the ICU at WakeMed Hospital. My condition quickly deteriorated. 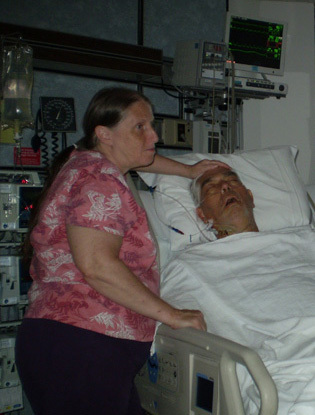 Severe sepsis was overwhelming me while I suffered acute renal failure, acute liver failure, severe pain, rapid breathing, and a fever sometimes peaking at 104.9 degrees. I also suffered extensive edema, jaundice, and was disoriented with delirium and multifactorial encephalopathy. I felt desperate as I felt myself moving toward the edge of death. The doctors told my wife Nancy (pictured) that if I did not improve in the next 24-48 hours, I would die. My despair was replaced with hope. After ten days in the ICU, I was blessed with a miracle, and I began to recover. 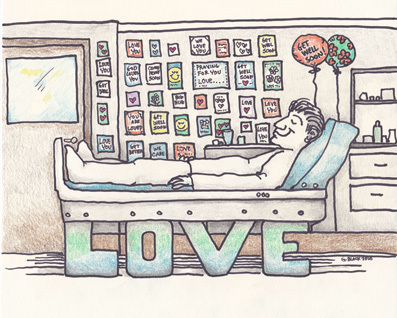 A Divine presence could be felt in the ICU. God was bringing me back, and I began to feel inner peace. But, it was a long road to recovery. Month after month I struggled to overcome the impact of severe sepsis, until 15 months had passed. 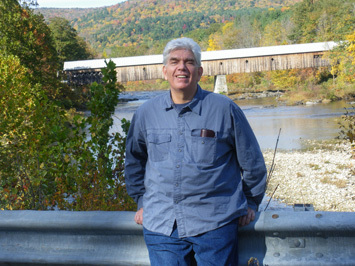 This picture was taken in October, 2010 at a friend's cabin in the mountains of southern Vermont. I had time to really relax, and I felt much better. My wife and I had the time of our life immersed in the beautiful Fall colors, as we hiked along rocky rivers, explored covered bridges, and ate pancakes and Vermont maple syrup at a local restaurant. I renewed my spirit on this trip and felt energized to complete my book Gyroscope when I returned home. 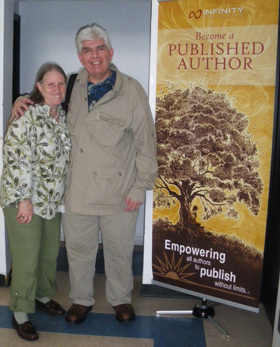 On May 17th, 2011, my wife and I flew to Philadelphia to launch my new book Gyroscope at Infinity Publishing, located in West Conshohocken, about 20 miles from Philadelphia International Airport. The knowledgeable and professional staff at Infinity provided us with a very positive, author-friendly environment that helped make the book a success. 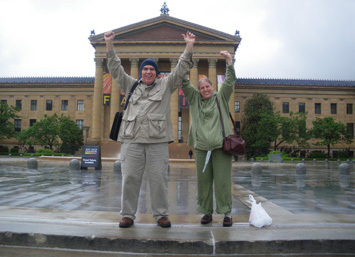 Here we are at the top of the "Rocky Steps" at the East entrance of the Philadelphia Museum of Art, mimicking Rocky&apos;s triumphant celebration. 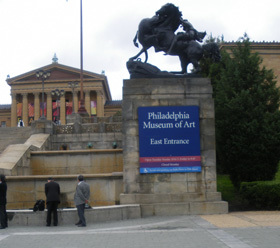 Making a trip up the steps became a symbol of perseverance, determination, and the successful completion of my book. At the top of the steps, we enjoyed breathtaking views of the city skyline. 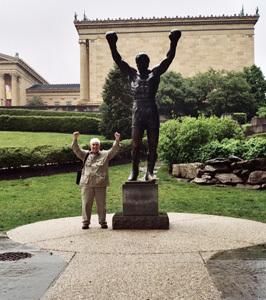 The Rocky statue, created by A. Thomas Schomberg, is an impressive bigger-than-life work of art. We also spent several hours enjoying the European Art collection from 1850-1900, especially the paintings by Renoir, Cezanne, Van Gogh, Pissarro and Monet. 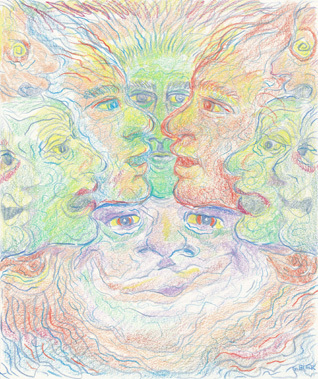 These are three drawings from my Art Journal in Chapter 10 of Gyroscope. When I am standing in line at the grocery store, waiting at the car dealer service department for an oil change, looking at guitars at the music store, almost anywhere at any time where I am talking with people about my survival of sepsis; the first thing they ask me is: "What's sepsis?" This happens over and over again, day by day, week by week; I'm asked the same question: "What's sepsis?" I should not be surprised, because surveys have shown that a majority of Americans are unfamiliar with sepsis, but I am very concerned, because lack of awareness and understanding about sepsis can cause an individual to delay seeking medical care. Sepsis can progress rapidly, and a patient can deteriorate quickly in a matter of hours. Since early detection and rapid, accurate diagnosis and treatment are paramount in the management of sepsis, awareness of signs and symptoms are of utmost importance. In my own case, sepsis was a barely noticed subtle progression, and I did not go to the doctor right away. I thought I had a sinus infection with a mild fever and self-treated at home, but the bomb was about to explode, and I didn't know it. The progression escalated and I experienced restricted breathing, and pain in my lower right abdomen and lower back. I became more and more irritable, and was unable to focus on extended conversations. I bent over in pain, shivering and shaking all night. I barely made it to my doctor the next morning. I was rattled and began to panic. My fever was at 102 degrees, blood pressure 125/71, and pulse at 137. I became dizzy and disoriented. The doctor said I was septic and needed to pick a hospital in the next ten minutes. If I had waited any longer to seek medical assistance, I would not have survived. Sepsis is a range of clinical conditions caused by the body's immune response to infection or trauma. This Systemic Inflammatory Response Syndrome (SIRS), an overwhelming response to infection, may produce symptoms such as: fever, low temperature (hypothermia), increased heart rate, faster respiratory rate, high or low white blood cell count, altered brain function, low blood pressure, low oxygen level, low urine output, and many other potential conditions. Sepsis can be subtle, unpredictable and complicated. Symptoms such as fever, rapid pulse and respiratory difficulty may mimic other disorders. Sepsis is an aggressive, multi-factorial rapid killer. When it becomes severe sepsis and causes organ dysfunction or failure, it is often deadly. You can die from your own body's response to infection, rather from the infection itself. If you encounter an onset of these symptoms, get to the doctor or the Emergency Room. Don't wait, and don't hesitate, because sepsis escalates quickly and requires immediate and aggressive treatment. SEPSIS RECOVERY	- NOW WHAT? When you come home from the hospital after an encounter with sepsis, it is not business as usual. There are several adjustments that you may need to make, and you will need to be patient, and so will your family and friends. One of the most common misdemeanors is trying to do too much too soon, and then regress afterward in your recovery. I call it the old one step forward and two steps backward. It takes time to recover and stabilize after a battle with sepsis. You have more than likely been "deconditioned" by the illness and will need physical, mental or spiritual therapy. This can include exercises outlined by a physical therapist at the hospital, and perhaps some of your own routines, but done in tiny increments. Some people may need to adjust to using prosthetic devices if they have had amputations, others may use a cane or a walker. You may need help to focus mentally on particular tasks, remembering things, reading, staying on tasks and completing them. Your attention span may waver and need a little help. You may also want to pray and exercise faith in a higher source to help you achieve a successful recovery from your impairments. With your weakened condition, you will need to rest, follow any doctor recommendations, take any prescribed medications, and eat properly. Rest is so important. You may need a "time out" from some tasks until you return to as close to normal as possible. Let people help you. Someone else can do the shopping, cooking, cleaning the house, wash the car or mow the lawn. If you need help paying the bills or writing checks, have a trusted person do it with you. If you have nobody to help you, ask someone to contact agencies and organizations that offer assistance. Recovery is not predictable, and may take weeks or months, and for some sepsis victims, it may take longer than that. You may want to create a progress journal while you recover, where you write down dates, comments, and express your feelings. You may recover 100% and return to a normal life, or you might suffer an impaired quality of life with new challenges to overcome such as cognitive impairment or a suppressed immune system. You may need to limit exposure to crowds at the theatre, store or mall until you are stronger. I stayed home because my immune system took a real slam, and I didn't need a bout with another illness. I'm not a doctor, so situations and their resolutions will vary, and I can only speak to you from the research I have done, and my own experience as a sepsis survivor. A health professional that is knowledgeable about sepsis, sepsis outcomes and treatment will be your best choice. I know that a battle with sepsis is a major "interruption" to your life, turning things upside down and making you feel helpless. Try to stay positive, keep going, and don't give up.